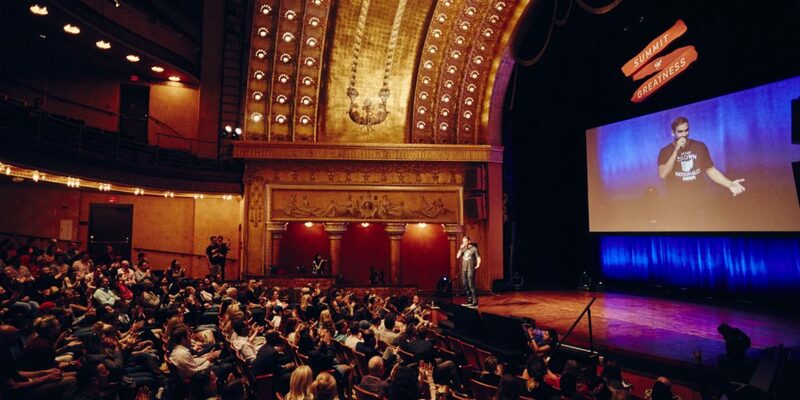 Whether you want to record an episode with a world-class thought leader or host a solo-show, it’s more crucial than ever to have high-quality audio. The good news is that you don’t need to be in a expensive studio to get your podcast sounding professional. In this article, you’ll learn what gear to choose, what software to pick and other important recording tips for achieving the best possible sound. Finding the perfect gear for a podcast might seem like a lot of work. I can completely resonate, because there seems to be so many options and different recommendations from everybody so it can get very challenging to make the final decision. I often see people never starting their podcast, because they feel like they haven’t found the perfect gear. I’ve put together a list of gear, that works for majority of the podcasters. 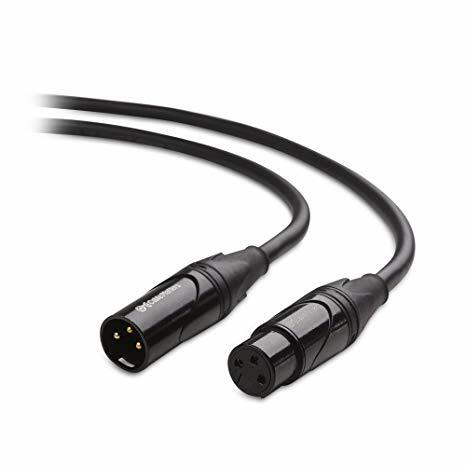 The first thing you should consider is whether you want XLR or USB microphone? USB microphones are highly convenient, where you just plug the cable to your computer and you are good to go. A good choice for a USB Microphone is Blue Yeti or ATR 2100-USB. You can also go with XLR microphones which are typically more expensive, because they need multiple components for setup. If you decide to invest into XLR microphones, you’ll see more options and higher flexibility. If you are serious about podcasting and want to get the highest-possible audio quality, I highly recommend going with XLR. 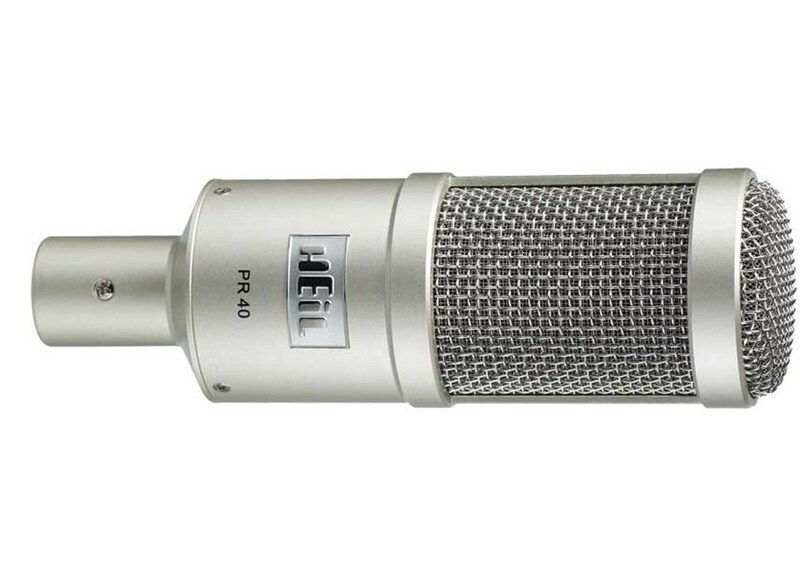 For XLR Microphone recommendations, my favorites are Heil PR-40 or Rode Podcaster. When using a XLR Microphone, you need a mixer or a USB interface, which is a bridge between the microphone and the computer. Audio interface simply transforms the analog signal to digital signal that you’ll be able to use. 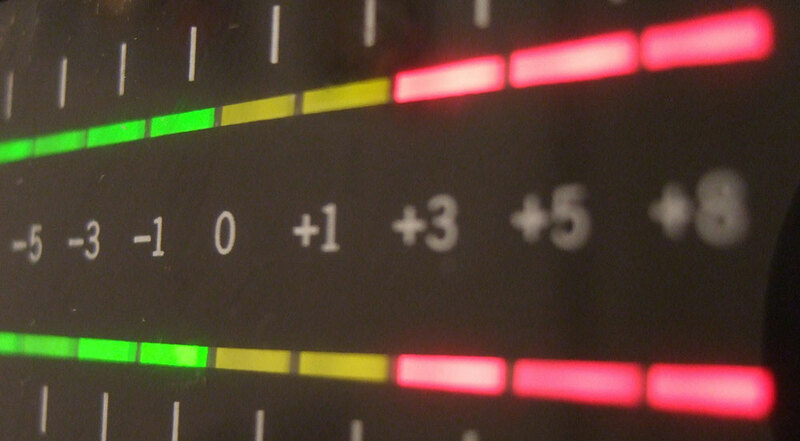 My favorite audio interface is Focusrite Scarlett 2i4 (2nd Gen). When you are recording longer episode, it’s nice to have earphones that are comfortable and prevent mistakes that can ruin an episode completely. If possible, uses closed-back headphones, so your microphone won’t pick up any unnecessary sounds from the earphones. 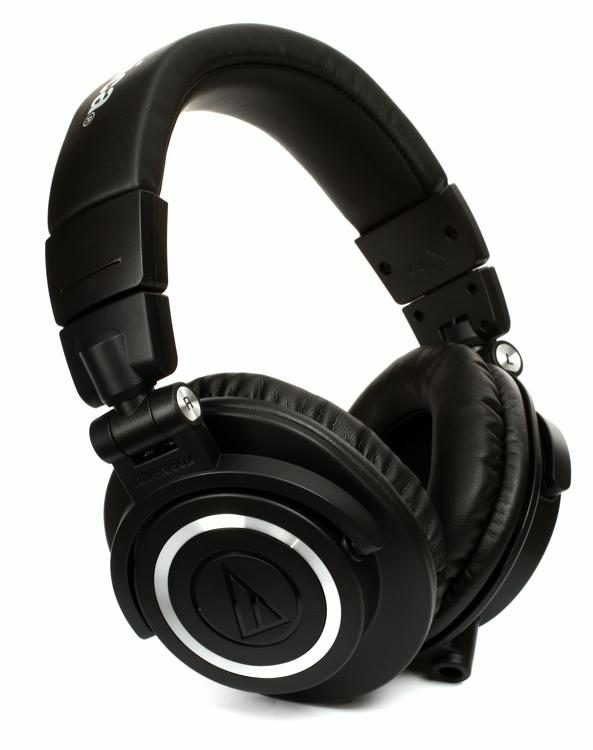 My favorite recommendation is Audio-Technica ATH-M30x, which is one of the most popular options out there, and for a good reason. 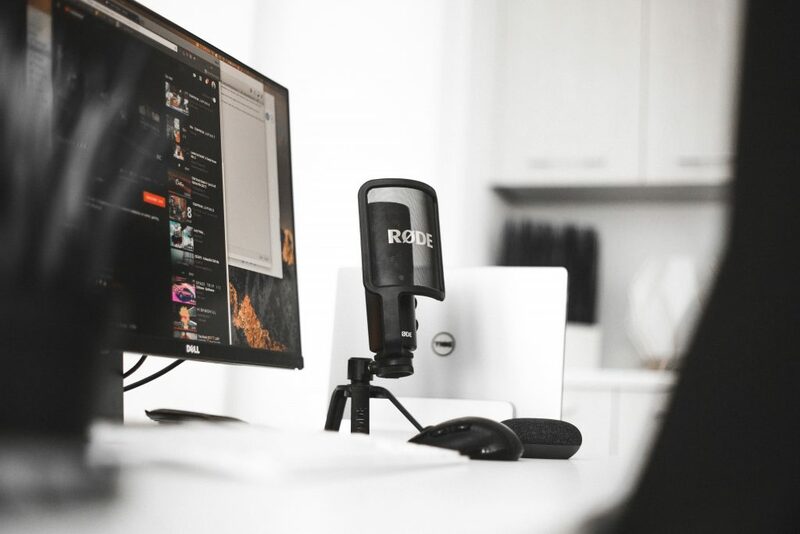 Microphone stand will allow you to move your microphone around comfortably and make your life a lot easier as a podcaster. I love using a boom arm, instead of a desk stand because it’s just more practical. Boom arm gives you better posture, better audio quality, and it even frees up a lot of space on your table. I like to recommend Heil PL-2T, which takes just a minute to set up. You’ll be able to tighten the vice to your table, slide the boom arm into the hole, and your ready. 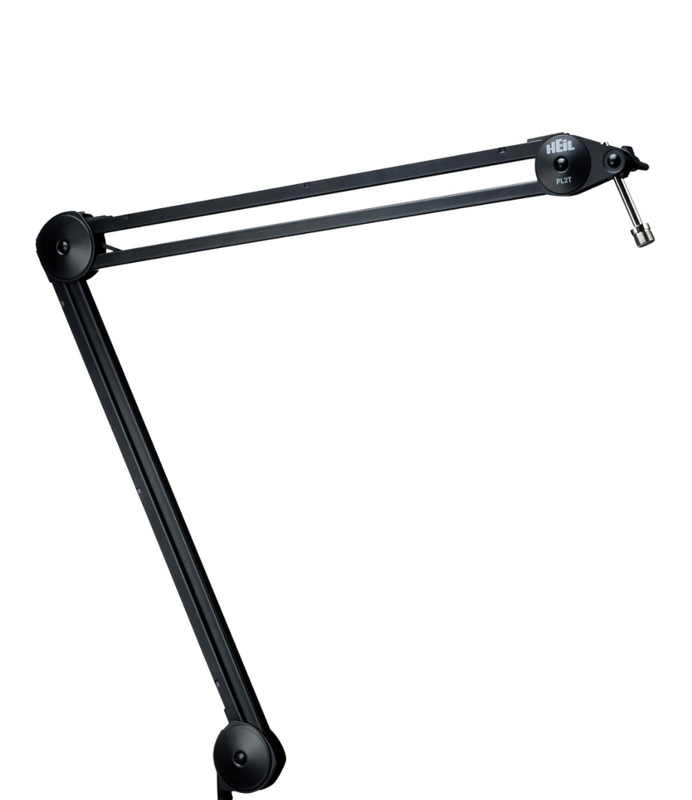 This boom arm rotates 360 degrees, and holds your microphone perfectly steady. 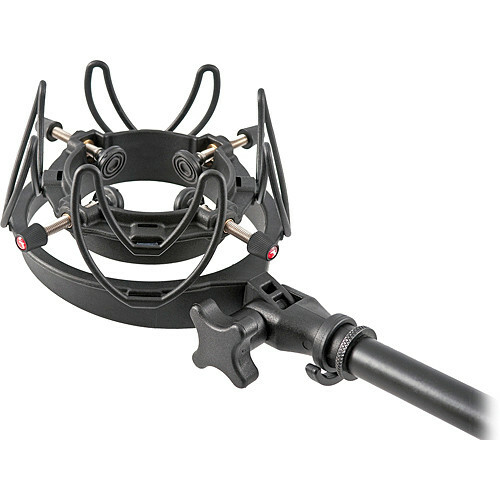 Shock mount attaches to your microphone stand and it reduces vibrations and other noises traveling into the microphone. For example, these sounds could be simple taps on the desk, typing on your keyboard or simply moving your microphone during the episode. Most microphones out there have a compatible shock mount built just for them, which you can just find by doing a quick search on Google: “Your microphone + shock mount”. You can also get an universal shock mount and a good choice is Rycote InVision Universal Shock Mount. This small device can make a huge difference in the recording quality. The job of a POP filter is to prevent plosives – explosive consonants, such as ‘p’ and ‘b’ sounds. Words that start with these letters, tend to produce a higher burst of air, which can result in popping sounds in your recordings or distortion. 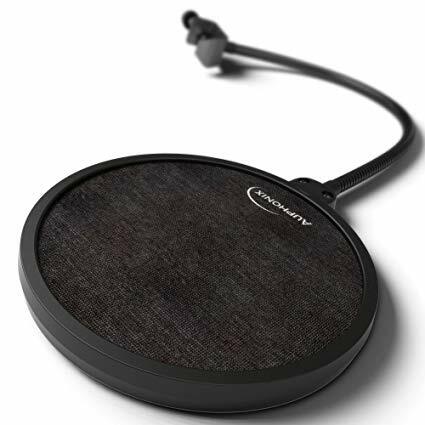 POP filters are inexpensive, and 6-inch pop filter from Auphonix does a perfect job. You’ll be using cables to connect different parts of your recording setup. There are hundreds of different microphone cable brands out there, but if possible, avoid the really cheap ones. Nothing is worse than recording a podcast episode, and then later realizing that there is a high-pitched noise in the background. I use the brand Cable Matters for all of my cables. Now that all the gear is figured out, you need a way to record the episodes. If you want to record a interview-style episode with a remote guest, using Skype and eCamm Call Recorder is a good way to go. 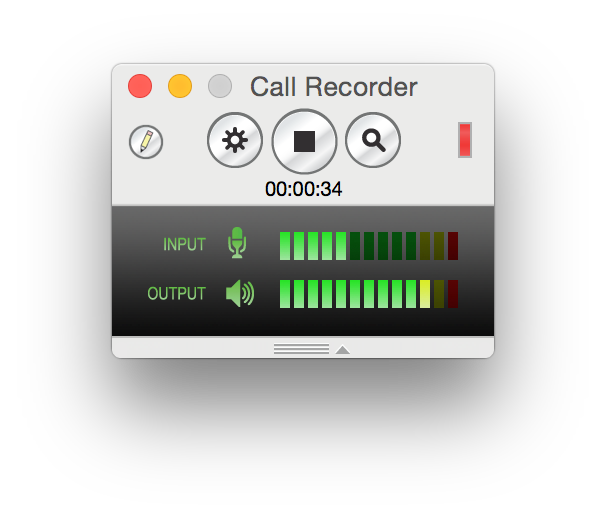 All you have to do is install both of them, and once you start a call on Skype, eCamm recorder automatically records the interview. If the other person doesn’t have Skype, you can still dial in to their cell phone from your side of Skype and have a conversation. You can also use ZenCastr or Zoom for recording remotely. 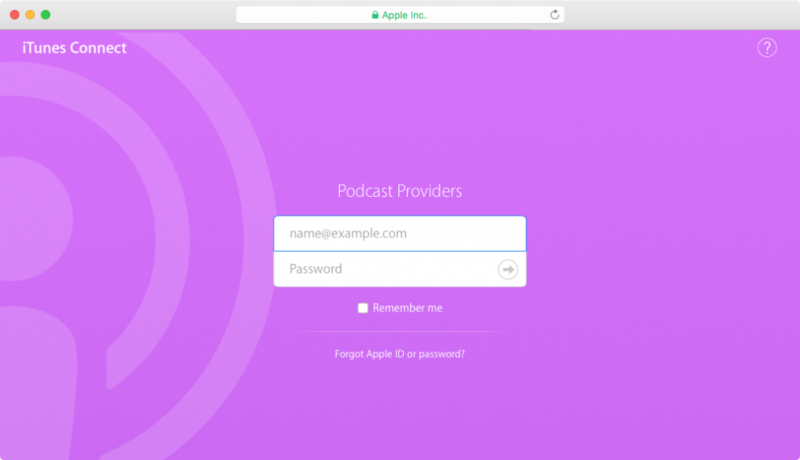 If you end up using Zencastr, you’ll just send a web-page recording link to the guest, hit record and your good to go. The end-result is two high-quality recordings. If you want to do a local recording with a guest, or do a solo-episode, you can just Quicktime for mac, Sound recorder for PC or Audacity that works with both systems. Now, 3 tips that will help you record better audio. When recording an episode, the key is to be consistent as possible with the distance from your mouth to the microphone. This happens most commonly during interviews, where the guest has been speaking for a few minutes, and then the host forgets to lean back to the microphone and it will directly reflect in the sound quality. Simply make it a habit to always speak from the same distance to the microphone. If you record an episode too quietly, in most cases you’ll be able to bump up the levels later and have a good final product. On the other hand, if the levels are too high, the signal turns red and it clips and there is nothing you can do in the post production. To make sure that your in the safe zone, make sure that the meter never turns red even at the loudest points in your audio source. Whenever you switch gear, software or anything else, it’s always a good idea to do a quick test-run to make sure that everything is working the way it should. You don’t want to record an episode and then later find out that nothing was recorded or that there was a loud buzzing sound. A simple test can save you from a lot of headache later. It might seem like a lot of steps to record just one podcast episode, but it gets easier and more natural overtime. I really believe, that podcasting is an amazing way to share your passion for a topic, reach a lot of people and make a difference. If you’ve been thinking about starting a podcast, take a first step today and see where it takes you.